Resilience is an important skill in being able to cope with and overcome adverse situations and experiences. The Developing Resilient Children course helps parents build and strengthen their children’s resilience to cope with challenges in their lives. Parents will benefit from the workshop by becoming more reflective, pro-active and in tune with their children’s needs. This workshop is FREE and suitable for parents of children 12 and under. Berri Children’s Contact Service is turning 10 years old! Join us for morning tea to help celebrate our 10th Birthday and National Child Protection Week. 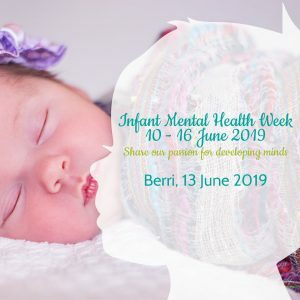 Join us for an event in Berri for Infant Mental Health Week.